Calusa Cast Nets are designed to meet the requirements of the demanding fisherman. These handmade nets are manufactured using six-panel construction, 1 1/2 lbs of lead per foot (ie: 10′ net = 15 lbs). They are made with the highest quality copolymer monofilament. The combination of the fine mesh quality and handmade craftsmanship makes for a cast net that feels softer, throws easier and lies flatter than any other net available. 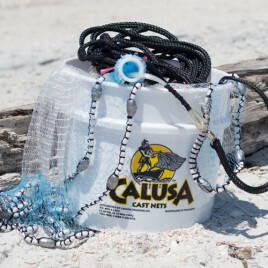 Calusa Cast Nets are constructed with the highest quality materials available and are the finest nets on the market. SHIPPING: All of our Calusa cast nets ship for a flat rate of $25/each. View Cart "5/8″ mesh x 12′ high" was successfully added to your cart.